Belize is a diverse country, known primarily for its ancient Mayan temples, lush jungles and sun drenched islands. Most visitors to the Caribbean coast are recommended to stay on the popular Northern Cayes, specifically Caye Caulker and Ambergris Caye. Though only a short ferry ride apart, the islands are actually quite different. Both have easy access to the Belize Barrier Reef and its abundance of marine wildlife, but each has its own distinct vibe and reputation. Our conversations with fellow travelers revealed completely different descriptions of the islands. Not surprisingly, when we stayed at the luxurious Ka’ana Boutique Resort and the Lodge at Chaa Creek, guests raved about Ambergris Caye and its white coral beaches – but they didn’t think much of Caye Caulker. When we stayed in the towns of San Ignacio and Placencia, younger budget travelers said, “Ambergris Caye is too expensive, head to Caye Caulker instead. It’s less touristy and more laid back”. Lucky for us, our itinerary included both islands! We were escorted to the beachfront Plantation Villa that would become our home for the next three nights, and we were immediately impressed. The large tropical grounds are neatly groomed with dozens of tall, shady palms scattered along the silky smooth white sandy beach. The photo above is our spacious wooden deck of our Plantation Villa, complete with comfy loungers, chairs and hammock. The relaxing moments spent on that private deck are some of the most memorable from our stay. 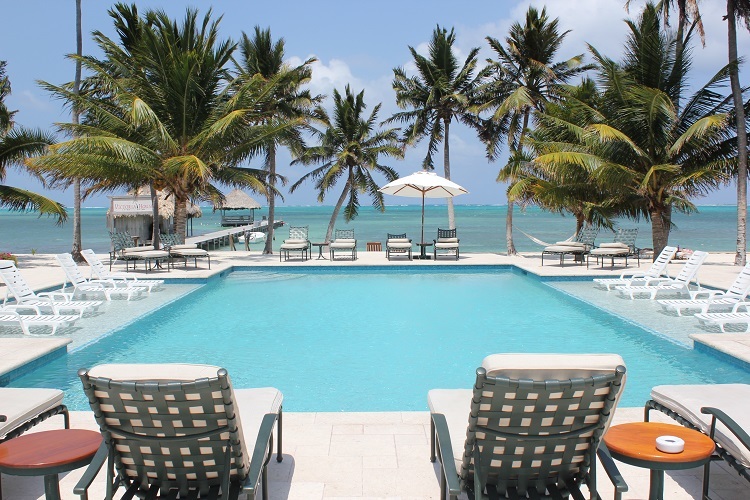 The main pool at the hotel has unobstructed views of the colourful Belize Barrier Reef. If you look closely at the horizon, you can see the white water crashing on the reef, giving perspective to the proximity of the Western Hemisphere’s largest barrier reef. Because there are so many outdoor activities to do while on Ambergris Caye (fishing, diving, snorkeling, kayaking, cave tubing, etc), the main pool and beach were often empty during the day. We had already spent full days snorkeling the Belize Barrier Reef and searching for whale sharks, so we were quite content simply lounging by the pool, taking full advantage of our luxurious tropical surroundings. At first, we couldn’t put our finger on what made Victoria House feel so romantic and exclusive. Of course, the private beach helped, but it was much more than that. We thought there were only a few guests staying at the hotel, but as the days passed we realized the boutique hotel was actually almost at capacity. The calm atmosphere is the opposite from what you would find at a typical all-inclusive. The loungers and hammocks are strategically spaced along the beach, giving us the feeling that we had the entire beach to ourselves. It never felt crowded and we always had several choices beside the pools or on the beach. Because it is east facing, it’s also the perfect beach to capture a Caribbean sunrise. Above: Casita at Victoria House in Belize As much as we love sinking our toes in silky sand, we also love hanging out on waterfront docks. Canada has a lot of fresh water lakes that usually have docks, so we both have fond memories of summer days spent chilling out on the dock with a cold beverage in hand. We were thrilled to learn that Victoria House not only has a dock for its guests, the dock is outfitted with comfy loungers and a thatched roof for shade. The loungers had our names written all over them! It’s not every day that we find ourselves relaxing on a private dock with unobstructed views of the Caribbean Sea, so it’s easy to see why this was a highlight for us. Above: Cameron standing on the deck of our Plantation Villa. The Restaurant Palmilla at Victoria House is one of the best dining experiences on the island. There is an air-conditioned fine dining room and an outdoor patio with views of the pool and ocean. One evening, a couple was served dinner directly on the beach, surrounded by tiki torches and the sound of waves crashing on the shore. We preferred to sit outside on the patio under the stars, with the cool ocean breeze chasing away the bugs. Although we usually like to try different restaurants when visiting a new place, we saw no reason to leave Victoria House. It has an informal yet romantic ambience, the food was fantastic and reasonably priced, and the tropical atmosphere was perfect. We began to feel like we were on a second honeymoon! Below are some photos of the delicious meals we sampled at Restaurant Palmilla. Above: pair of comfortable beach loungers on the Victoria House private beach. As a couple that travels extensively and has stayed at many hotels and resorts, we would highly recommend Victoria House. What we liked most about the hotel was that it doesn’t have the all-inclusive, mass tourism vibe. It’s the perfect tropical destination for couples looking for a quiet, romantic getaway – without the crowds. Where is Victoria House in Belize located? Victoria House is located in Belize a couple miles south of San Pedro’s city centre, which is an appealing quality because it creates separation from the city noise and party atmosphere. Victoria House and Ambergris Caye is also only one mile from the Belize Barrier Reef, the second largest in the world. How do you get to Victoria House in Belize? If you decide to fly from Belize City to San Pedro, upon clearing customs and immigration in San Pedro, a Victoria House staff member will meet you and drive you back to the resort. In the unfortunate event of a delay or their inability to pick you up, they will arrange for a taxi in front of the terminal to take you directly to Victoria House. If you chose not to fly from Belize City, you can travel by water taxi. Call Victoria House directly, and they will help you with schedules and pricing. The boat ride is about 1.5 hours, and the last boat leaves Belize City around 4pm. We loved our stay at Victoria House. 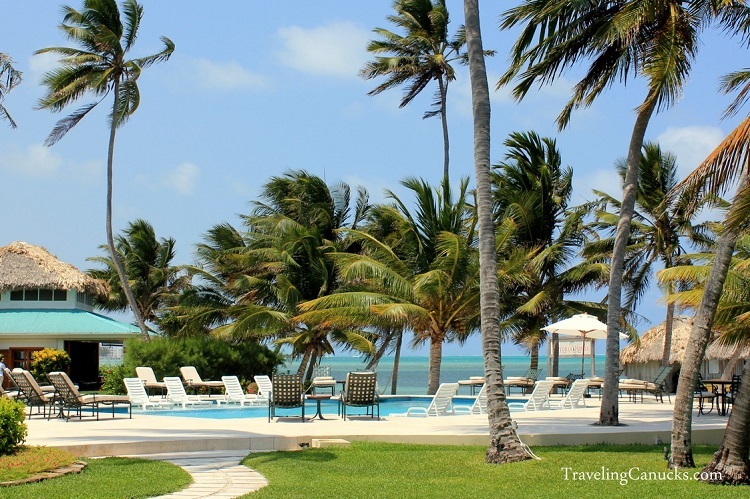 It was easy to see why Victoria House in Belize is consistently rated as one of the best places to stay in Ambergris Caye. 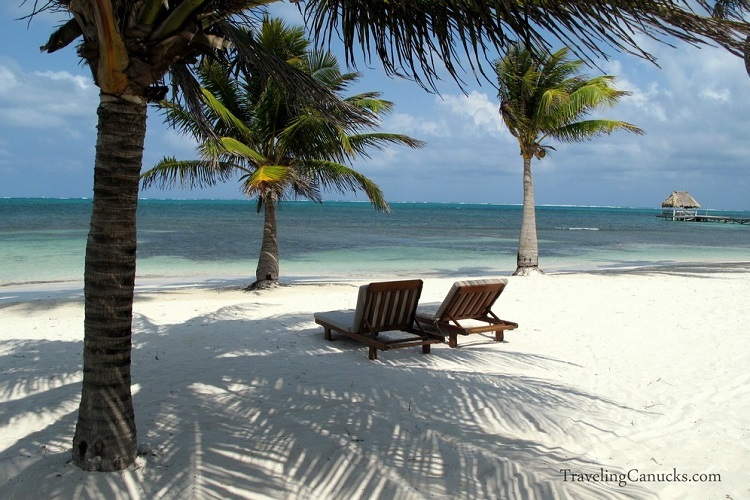 Have you visited Ambergris Caye in Belize? What did you think? Seriously you guys, you’ve sold me on Belize. SOLD. I’ve been traveling to Aruba for the past three years and felt that was our favorite island but Belize might now be a must visit in 2011. Thanks for the photos! They are as crystal clear as the sand and the sea and it’s always helpful to have a candid lens. Thank you for the kind words Charu. We’ve never been to Aruba but hear great things. Happy to hear that you’re considering a trip to Belize! WOW, what a well written piece guys. Now we totally need to check out Ambergris….we did Caye Caulker a few years back to get our open water scuba certification, and LOVED it…..might i ask how you guys got hooked up with the complimentary stay? did they reach out to you, or vice versa? and how many nights did you get comped (in exchange for the review i assume?) sorry if that is crass question to ask…lol. Thanks for the positive feedback Mike, appreciate you taking the time to comment! Looks totally DREAMY (and we just came from that part of the world)! Great pics, and looks like you had an awesome time. Wish we could have made it to Belize. I have never really thought of visiting Belize but after reading this I am ready to head out today! The water, beaches, pool, and food – amazing. The pictures of the food – WOWsers 🙂 Hungry now. Great read. Thank you for sharing. Glad you enjoyed the post and photos Debbie! Oh, you poor souls….how long did you have to suffer in silence as you sunbathed in front of the infinity pool and then made to run barefoot on the sandy, white beaches? Was there no one to save you when you were forced to eat those delectable creations or wear those comfy white bath robes after sleeping like babies on that bed made from clouds? The Plantation villa was obviously the setting of your torturous couples’ full body massages, no doubt. The tough life you guys lead…..how strong you must be…..
Belize is a country known worldwide for its stunning beaches and tropical atmosphere that exists there, it almost becomes a tropical paradise. Belize is undoubtedly one of the mejorse tourist destinations in Central America. Wow! That really does look like paradise! Its funny how different groups have different opinions on places. We have found this a lot while travelling. It’s true. We find it’s all about the travelers experience. Those beaches look absolutely perfect. oh man, this post was not what i wanted to see during a melbourne winter! that hotel looks amazing! we have been travelling on the budget for a while, but its posts like these that make me rethink our choice. that hotel, food and location look amazing. The pictures of the beach and the pool were amazing. Then I saw the food! Wow! The food was delicious! It tasted as good as it looks. The area is amazing if you love the beach! The reef has so much to offer. wow you guys make me want to go to Belize and stay at this charming beautiful place. Really fanatic photos.